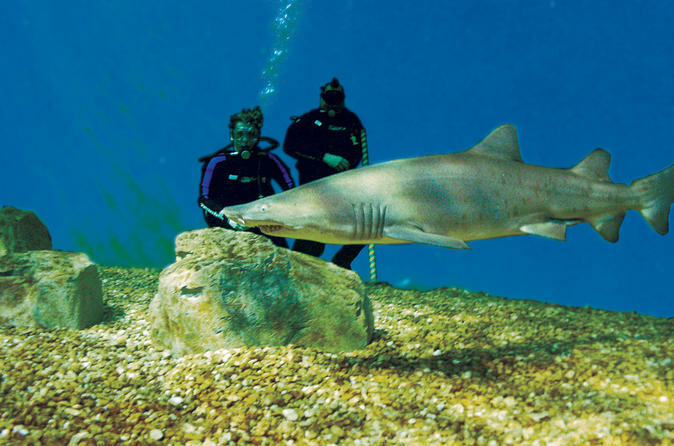 Add a heart-pumping swim with sharks to your short time in Tampa! A must-do for thrill-seekers, this shore excursion offers SCUBA-certified divers an educational presentation and the rare chance to swim with chilling sea predators. Enjoy the beauty of a live Coral Reef and an up-close look at sharks, eels, turtles and other magnificent sea creatures. Please note: A valid C-card must be presented to partake in the dive. Get acquainted with ocean’s notorious — and commonly misunderstood — predators. Delight in the animals’ curiosity as they investigate you. Due to the intimate group size, each swimmer will have a designated dive master guide. When your swim is over, towel off, tour the rest of the center and enjoy some tasty nibbles from the café or restaurant (own expense). Don’t forget to pick up your souvenir t-shirt and photo of your swim! Advanced reservations are required for the Dive with the Sharks program; same day booking not available. This excursion is located within a 10-minute walk to the cruise port, so you determine the time you return to your ship in Tampa. Please allow yourself ample time to enjoy the excursion and ensure your timely return to the port. This excursion is not covered by our Worry-free policy. There are two dive masters in the exhibit with you and one surface tender present during all dives. This program is operated with the highest standards of recreational diving. The Florida Aquarium dive team is trained to supervise recreational diving activities by recognized scuba-training agencies. Emergency oxygen and first aid kits are onsite for all diving operations. The dive and security team have a well-practiced emergency action plan in order to handle medical emergencies. All team members are trained in the use of emergency oxygen, first aid and CPR. The dive master reserves the right to deny any guest diver the opportunity to leave the shark cage if the safety of the diver or the animals is in jeopardy.